Whenever Jiang Wei uses a non-delay tool card, he can use an ATTACK card to attack a character in his attacking range. 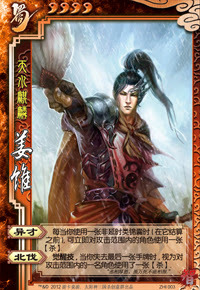 Whenever Jiang Wei uses or loses his last hand card, he can choose any character in his attacking range. Jiang Wei attacks this character.